A chance to carve wood on a grand scale, no experience necessary, just a desire to learn. Situated in a lovely studio next to the River Thames. The day begins with tea, biscuits and gathering as a group. This is a time to share our names and our own experiences of working with wood. 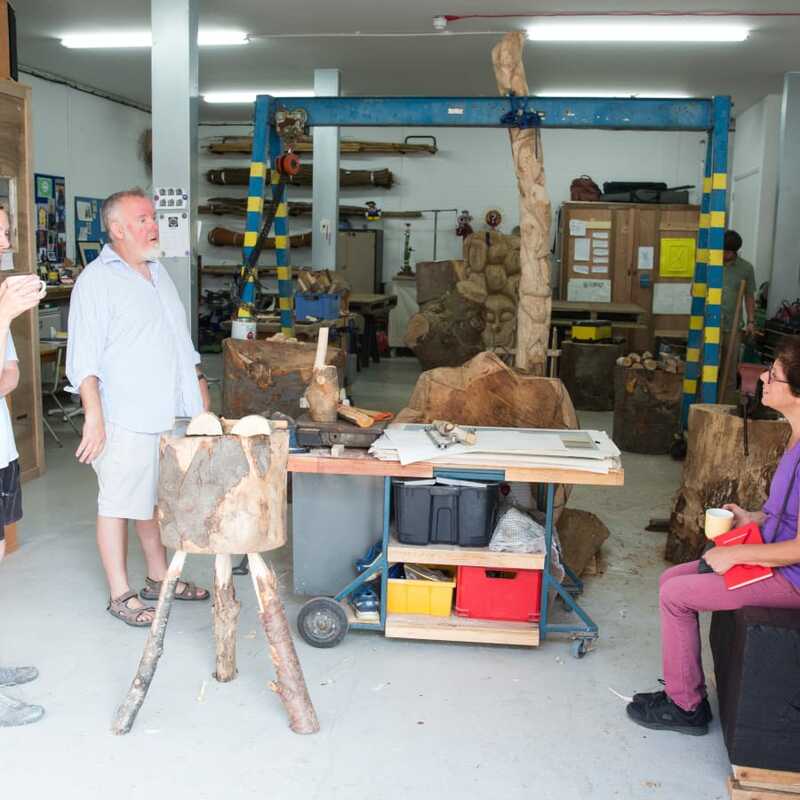 This workshop is as much about humans learning to work together as it is about carving wood. This also allows Stephen, your teacher, time to gauge the skills of the individuals. Stephen will give a demonstration of the tools you will use and the basic techniques/safety requirements to get the group going. 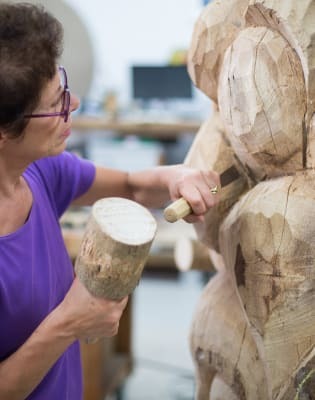 The workshop has always got three to four large public wood sculptures on the go, designed for local causes, of which to be donated. 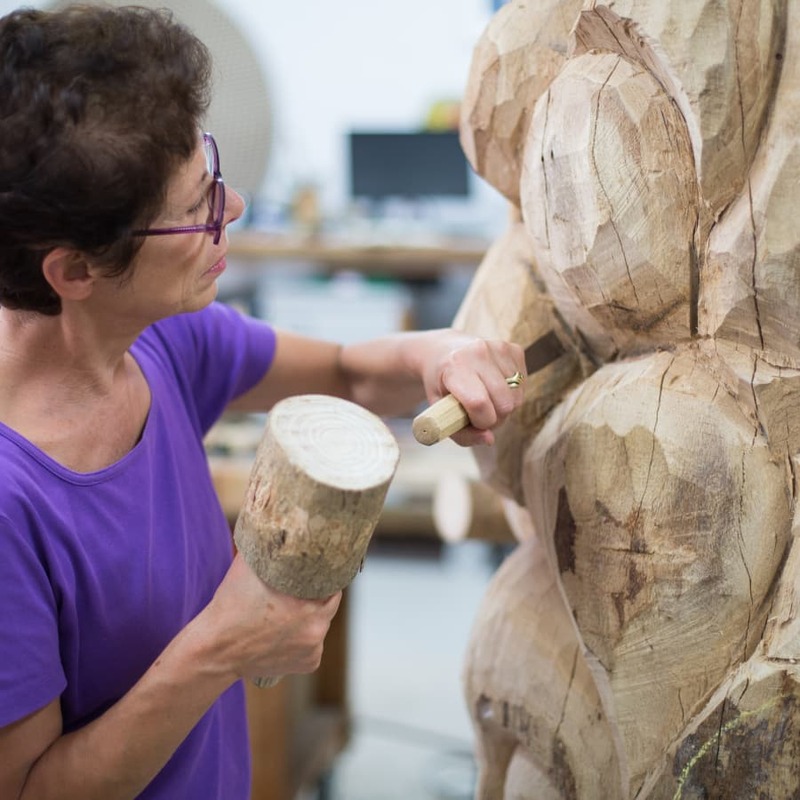 There will always be work needed to be done to sculptures that allows the participants to learn all the levels of Wood carving. The carving process will start by learning the initial stage of blocking out. This is a hard, physical process where you use large chisels and a lot of force. With only hand tools to be used, it pushes you to learn how to be efficient with your energy and technique. It is a real work out for your upper body and such good fun as a group to do! To keep the energy flowing you will then move round the circle and start to work, in finer detail, upon what the last group has blocked out. This is where more creative decisions come into play. But don't worry, you will be supported at all stages throughout the day. After lunch (a beautiful vegan and vegetarian meals is provided) we will get on with the finer detail using the finest chisels. This is the final surface of the sculpture and your mark making will be offered directly to the public sphere. 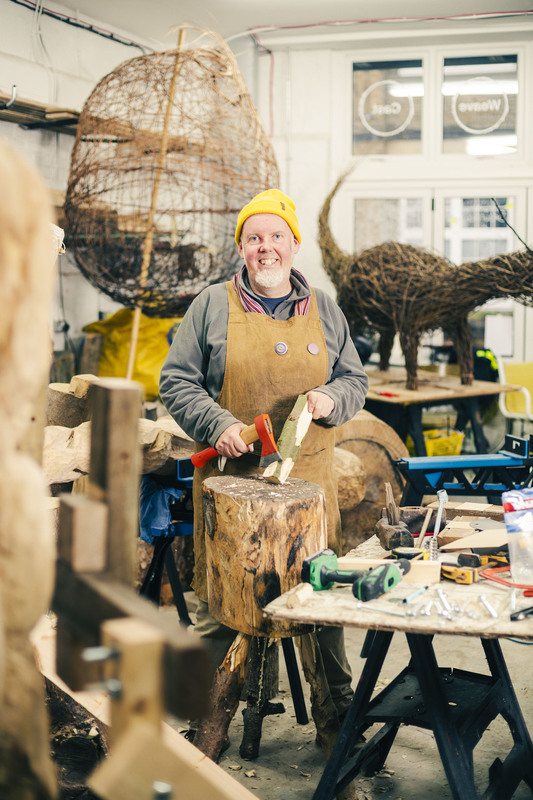 Stephen hopes to share his enthusiasm for carving and public sculpture. With over 30 years of experience, try your best to take in as much information as you can! The oldest found carving is over 77,000 years old! Teaching was informative and friendly. The venue is well supplied with equipment required and has free on site car parking as well as a cafe with a outdoor terrace with a view of the river. I had a amazing day at Creative Nature HQ. The teacher/artist, Stephen, was very friendly and has incredible knowledge of wood carving/sculpture and wood working tools. Stephen started by welcoming me and making me a nice cup of tea. I enjoyed my tea as he gave me a tour of the studio/workshop and its facilities. During the walk around he explained and demonstrated what the tools are and how they are used. After this introduction I was shown how to make a mallet out of a solid piece of Ash. This is a very simple and clever process which was really satisfying to do. After lunch I learnt how strip the bark from a large oak tree trunk. I then got involved in some large tree trunk carving (be warned this is highly addictive :-) ). I sculpted by using a variety of specialist carving chisels and of course the mallet I had made earlier. All in all the day was very enjoyable. The studio is spacious and bright and Stephen was extremely friendly, helpful and knowledgable. Highly recommend this class.......Great day. Thank you Stephen. A fantastic experience for me and my friend. Stephen is a wonderful tutor, of whom is patient, informative and a great laugh. My friend and I had never carved before and were a little nervous. But with the great environment and the people we were working with, it felt very natural. The idea that the sculpture, we were working on, being donated to a local park, made the experience even more fulfilling. Will book another class soon and bring more friends! I had a fantastic time on this course. I learned so much about woodcarving and working on such a large bit of tree was quite awe inspiring. The other students were a great bunch and the fact that the finished sculpture will be donated to a local site made us all feel very engaged. Working collectively was a good lesson in team support. By the end of the course I felt like I'd really achieved something special. It was fun informative and Srephen is a gifted teacher. Stephen creates a wonderful atmosphere of group togetherness which produces a feeling of working as a team in a safe environment. Guidance, assistance and encouragement provided is there as and when required allowing scope for all involved to feel that they are contributing to a collective objective. Stephen is very passionate about what he does and bringing craft skills to any and anyone. He introduced us to the various pieces and projects he has worked on over the years showing us the scope of practice, sparking our imagination. We worked in a small team on a joint project, creating a large animal assembled out of wood. We axed into trunks, sawed, carved -did absolute everything from scratch being taught about the types of wood and tools appropriate along the way. I was very skeptical at first I could keep up with everyone but because the team was small, we all had a chance to get involved in all aspect and I quickly grew in confidence. Most of us ended up focussing on a particular part of the animal, Stephen trusting our creative skill no matter now new were were to the craft. The independence we were given was fab and I managed to explore each part of the creative process which surprised me. I came into the class having never carved a single thing, and left craving for more! I can't wait to clear up some space in my timetable as I truly hope to come back again soon! Bring comfortable work clothes and sensible footwear, there are sharp and heavy things around the workshop so protect your feet. **A beautiful Vegan and Vegetarian lunch will be provided** or there are a choice of 5 cafes for lunch within a five minute walk, hot drinks and biscuits are in plentiful supply. There is plenty of free parking on site and we have good transport links. If you have any of your own chisels you would like to bring in that would be great. I also run a tool sharpening service. All the tools and materials are provided. The sculpture goes to the public, but you take home memories, new skills and new friendships.